If you change the height of one thing, you need to change everything else too. Even a few millimeters or 1/8th of an inch can make a difference when you’re making height adjustments. Getting your keyboard at the exact position for you is an art. You want to make sure your shoulders are completely relaxed, and your forearms and wrists are as straight as possible. Raising or lowering from your perfect position can causes aches and pains right away or over time. Make a small mark on your desk or wall to make sure you have the right position every time. Even a few millimeters or 1/8th of an inch can make a difference when you’re making depth adjustments. Achieving the proper lumbar support is important. If you don’t get it right, you can end up with increased back pain. Many chairs have pre-molded lumbar support that unfortunately cannot be adjusted. If you have the means, adjustability in the form of an air pump feature in your chair is the best because you can inflate and deflate the lumbar support to the right depth for you. A height adjustable backrest will help you get the proper positioning so that the curve of your low back is supported. If you wear bifocals, trifocals or progressive lenses, the monitor is best 2-3 inches lower than recommended. That’s because you read out of the bottom of your lens and having the monitor at the “correct height” will result in neck discomfort from your chin tilting up. Once again, height is crucial so keep playing with the height until you get it right. Buying random “ergonomic” computer equipment is a game of roulette. If you have wrist pain and buy a split keyboard or a new mouse hoping it will help, there’s a chance it will, there’s a chance it won’t, and there’s a chance you can make your pain worse. Also what’s termed ergonomic is always the case. Sometimes the word ergonomics is thrown in for marketing purposes. You can keep buying and trying stuff, but it’s better to get advice from a certified ergonomics consultant. It will save you money in the long run. Looking at the graphic can’t help you with unique postures. Leaning on an armrest, tilting your head to the side, or peering into the screen with your chin jutted out – these are all postures that aren’t helping you, but you may not even be aware you are doing them. If you do them too much, you can end up in pain. Your coworker can help you here again by observing you during the day and pointing out these potential problems as they see them. Looking at the graphic can’t help you with changing position. 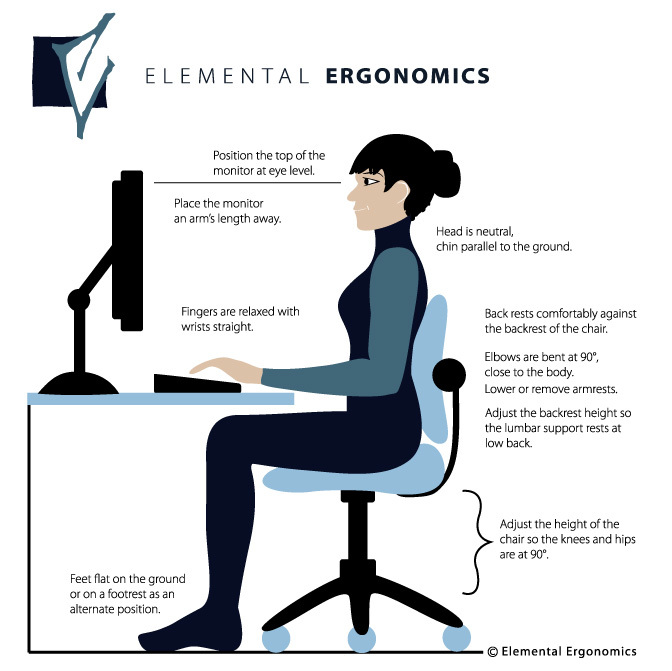 Changing your position is the best thing you can do to help yourself ergonomically. Make sure you move around in your chair as much as possible (even slouching and sitting forward on occasion) along with getting up and to stand, walk, or exercise. Staying in the “proper ergonomic position” all day every day is not very good at all. This graphic needs a picture of break time too! This entry was posted in Ergonomics, Health, Productivity, Stretching, Wellness, Work and tagged back pain, exercise, lumbar support, neck flexion, neck injuries, neck pain, posture, stretching. Bookmark the permalink. Great tip on the Drink Water App, Kimberly! Setting it for every hour if possible would be even better. ← Move it, will ya! Ergonomics served best active.